VANKLEEK HILL, ON – Just a week after the release of collaborative beer with Stone City Ales, Halcyon Barrel House – the off-shoot of Beau’s All Natural Brewing dedicated to mixed fermentation and barrel-aged beers – has announced the release of another new limited edition brand. 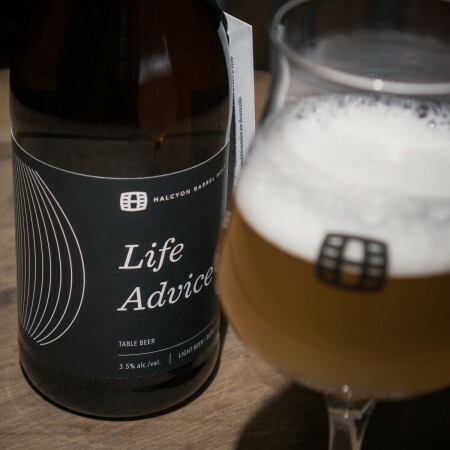 Life Advice was fermented with Belgian saison yeast and a custom mixed culture of Ontario wild yeasts and lactic acid bacteria. Its light hop profile features Strisselspalt and Hersbrucker varieties. [It] pours a hazy straw gold with light foam lacing. The aroma is mild and fruity, with subtle peach and and wine. A soft grain flavour plays in the background to a more dominant fruity yeast character. Just a bit of tartness contributes to its refreshing nature. Effervescent and barrel-kissed, this easy-to-enjoy saison finishes dry, and leaves you wanting more. Life Advice was released on Friday September 8th, and is available exclusively at the Beau’s retail store while supplies last. Next up from Halcyon will be Gravity Well, a 9% abv sour ale. Release date and more details are still to be announced.